Movies that have delved into the realms of outer space have usually fallen somewhere in the triangle of the sublime, the ridiculous and the farcical. Avatar, Star Wars I-VI, and Lost In Space give credence to this (erratic) trinity in varying ways. Among the spaceships, the ray-gun shoot-outs, and the convergence with antenna-eyed or raptor-style aliens, there has been little room (ironically) for realism in a film set in space. Until now. It may have none of the above, but Gravity gives us a true and uncomfortable feel for what it is like to be outside of the Earth’s atmosphere. Dr. Ryan Stone (Sandra Bullock) making some repairs to the shuttle in view of Earth. Gravity centres round Dr. Ryan Stone (Sadra Bullock), a Mission Specialist. She is on her first expedition into space, led by Matt (George Clooney), a veteran on his last voyage into space. Dr. Stone is making repairs to the shuttle that she and Matt are flying with, when debris from an explosion on a Russian satellite smashes into their shuttle. With the shuttle damaged irreparably, Dr. Stone must find another shuttle if she wishes to return to Earth. That is essentially the storyline for Gravity. One problem with the plot is that the film uses up its central premise within 30 of its 91 minute running time. This means that for the last hour, the movie recycles itself instead of flesh-eating alien invasions or putting inter-galactic arsenals to the test. But for those who would rather see another Star Wars, Prometheus or Elysium, do not lose faith. Gravity is very engaging. It has moments of knuckle-whitening tension, amplified by the fast beat, gradual crescendo and sudden silence of the music; all whilst our main character tries to reach another space vessel before her oxygen runs out. 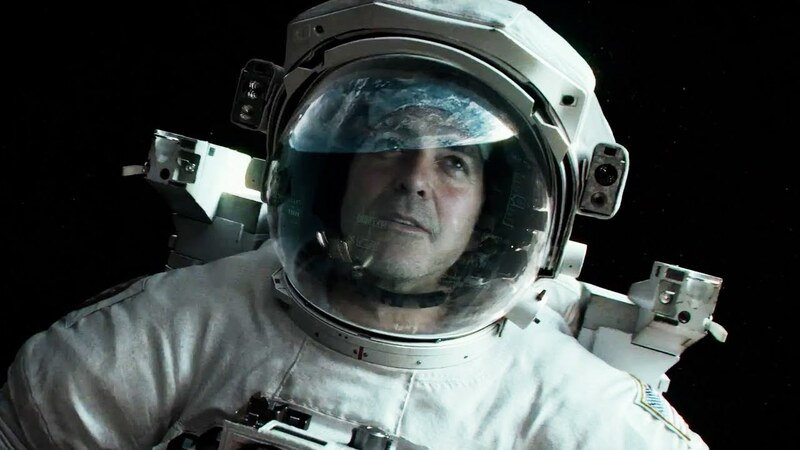 In respect of tension, the movie is similar to Sanctum; only in Gravity, Alfonso Cuarón’s directing style increases one’s ability to empathise with the protagonists’ predicament. Predominantly, the film is seen through Dr. Stone’s eyes (or rather her space-helmet), as she swims around in the boundless, atmosphere-less blackness. Without a centre of gravity, the movie enables viewers to appreciate what it’s like to be in space, rotating endlessly unless one can find something to hold onto. 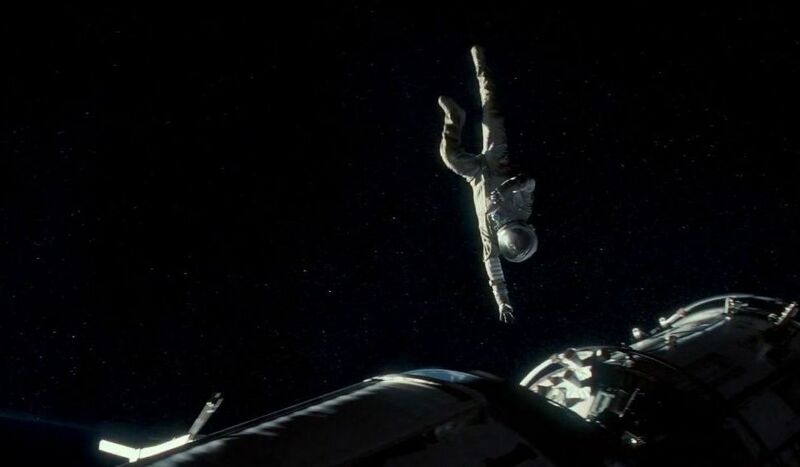 And unlike (the lamentable) Lost In Space, Gravity gives audiences a genuine taste for how scary it would be to get lost in space and to lose contact with the only people who might be able to find you. Matt (George Clooney), from behind his space helmet, gazing and admiring Earth, amidst the peace of outer space. In part, one feels the depth of this horror because of Sandra Bullock’s energetic performance. Her character is almost always in panic (as any human being would be in her situation) and this exacerbates Dr. Stone’s (somewhat) complex personality. Due to an unhappy episode in her past, we see her mindset switch from despair to a willingness to live on (and vice-versa) repeatedly. This is something which viewers can relate to on a human level, and it was very important that Bullock achieved this feat. For much of Gravity, she is alone on screen, and if she had failed to show Dr. Stone’s personality to the full, audiences would likely have stopped caring about her. The only other significant character in the film is Matt, played by George Clooney. And Clooney (surprise surprise) plays himself again as the smooth-talking, handsome wise-head, who goes and comes back (for plot convenience) to give sage advice. That is not to say that Clooney performs his role badly. It is just that we have seen this too many times already. Dr. Stone trying to grip a bar on the shuttle, or else she could be find herself adrift in the endless, empty abyss of space surrounding her. Moreover, audiences are treated to stunning visual effects. The emptiness that is outer space, in all its wonder, is shown to be disconcertingly large. What’s more, the 3D (for once) enhances the visual experience, even more so than it did in Avatar and Star Trek II: Into Darkness. In Gravity, when debris flies at Dr. Stone, one jerks one’s head out of the way, believing he/she will otherwise be hit! Considering how often the 3D does little more than darken the film and add a couple more quid to the cinema ticket, one must applaud Cuarón for augmenting the experience in a positive and noteworthy way. Over-all, Gravity is a great demonstration of what being in outer space feels like. That the film has no alien encounters or futuristic ray-gun fights gives the film an ironically grounded dimension that has been sorely lacking in so many other movies that have ventured into space. 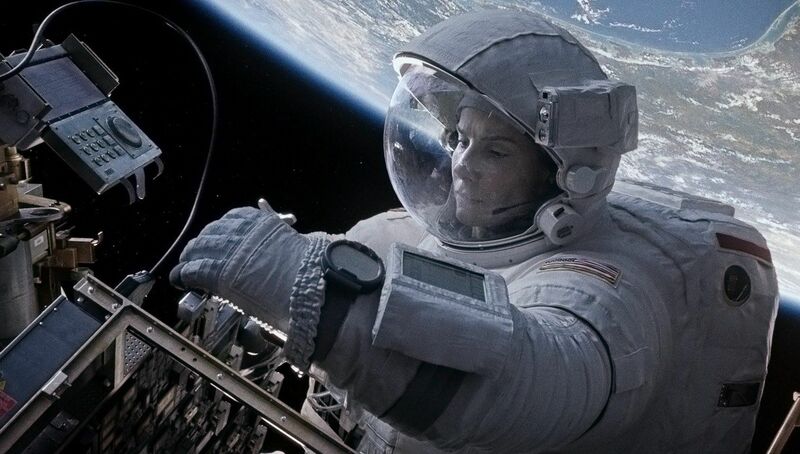 Due to Sandra Bullock’s great acting, the extraordinary level of consistency regarding the physics of space, the amazing special effects and the 3D, Cuarón has treated us to outer space’s awe-inspiring massiveness, as well as how frightening space can be when out there, lost. One of the most striking and farcical features of action movies is that there is much shooting, running and chasing, in one form or another, with key aspects of the plots taking place under such circumstances. The Die Hard, Mission: Impossible, and Fast and the Furious franchises all have this odd and surreal symptom. JJ Abrams and Damon Lindeloff, despite creating an enjoyable and watchable film, have taken this symptom to its zenith in Star Trek II: Into Darkness. 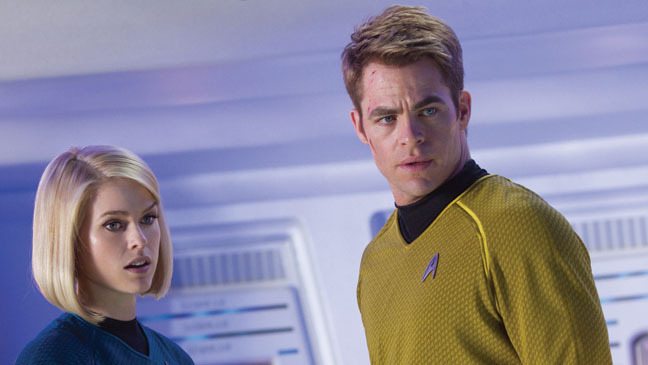 Captain James Kirk (Chris Pine) mulling over whether it would be a good idea to take Dr. Carol Marcus (Alice Eve) on board. Star Trek II begins with the galaxy under threat from John Harrison (Benedict Cumberbatch), a former Starfleet agent. Captain James T. Kirk (Chris Pine) is ordered by Admiral Alexander Marcus (Peter Weller) to lead the USS Enterprise ship to Kronos and kill Harrison. Kirk takes with him Commander Spock (Zachary Quinto), Lieutenant Uhura (Zoe Saldana), Dr. Leonard ‘Bones’ McCoy (Karl Urban), Montgomery ‘Scotty’ Scott (Simon Pegg), and Dr. Carol Marcus (Alice Eve) for assistance. In essence, that is the plot for Star Trek II: Into Darkness and it makes for an easy and entertaining 132 minutes, irrespective of whether one is a Star Trek fan or not, in the same way as the 2009 Star Trek film did. Moreover, the special effects in Into Darkness are terrific, and the 3D works a treat as well, especially in IMAX, which was designed for such films. 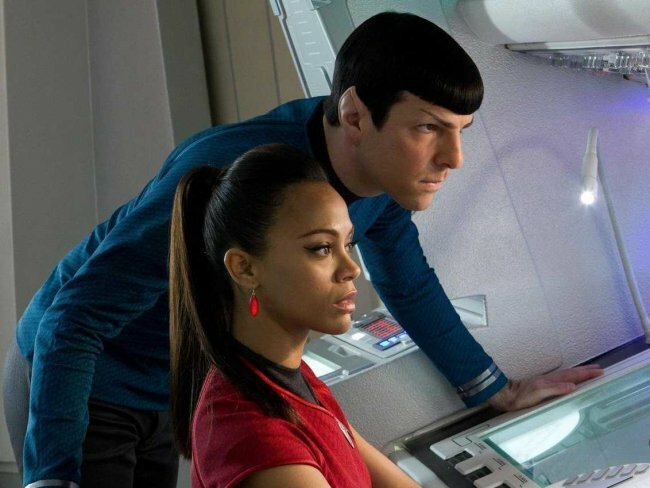 Commander Spock (Zachary Quinto) talking with his girlfriend, Uhura (Zoe Saldana). While Into Darkness has much in common with the 2009 Star Trek movie, the sequel has many more contrived aspects to its storyline than the prequel. One can almost draw the plot arch as the film goes along. Fans, though, are more likely to forgive such plot problems than non-fans. That is, if fans and non-fans have a chance to think about the issues with the storyline while watching the film. JJ Abrams and Damon Lindeloff have made every plot detail and element in Into Darkness be done either on the run or in the midst of a shoot-out. It is as if they knew that the movie’s storyline makes as much sense as Lost did by the end. Abrams (with his trademark lens-flare) and Lindeloff constantly distract viewers from being able to realise the plot’s deficiencies, here, in the same way that shoot-outs, explosions, chase scenes and stunts divert audiences’ attentions from the flaws in the various Die Hard, Mission: Impossible, and Fast and the Furious movies. 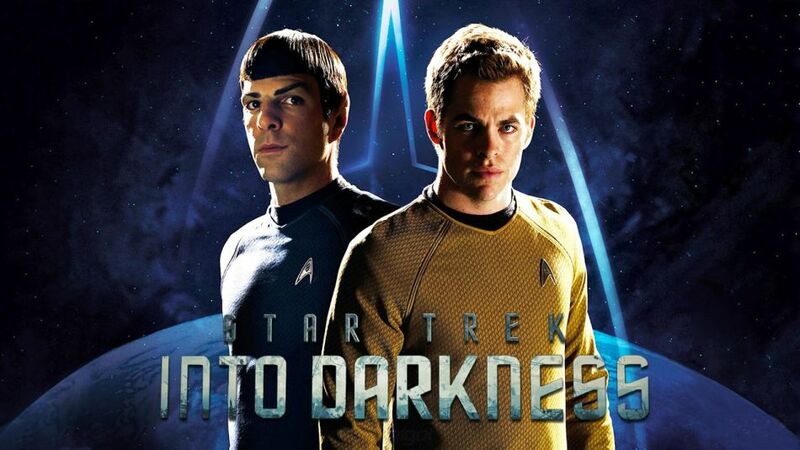 Provided one does not focus too much on the storyline of Into Darkness, one can enjoy the contrast in personalities between the impulsive Captain Kirk and the cold, rational Commander Spock, and both Chris Pine and Zachary Quinto play their respective roles very decently. There is also more humour than expected between the two of them, which is always welcome. The same can be said for Karl Urban’s performance as Bones and Simon Pegg’s as Scotty, as they play their roles well without being anything special. 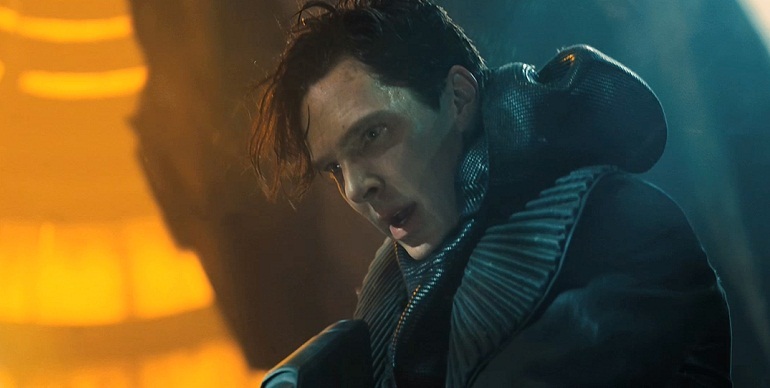 The villain, John Harrison (Benedict Cumberbatch), fighting against his adversaries who are out to kill him. Yet, the real star of the film is Benedict Cumberbatch. His acting, as the villain, is head and shoulders above the rest of the cast. When Cumberbatch speaks, it does not matter what he says or how ludicrous it may sound because it is stated with authority to the extent that implausible matters are believable. Regardless of whether one is a Star Trek fan or not, one should almost watch Into Darkness for Cumberbatch’s performance alone. Over-all, Star Trek II: Into Darkness is an entertaining film for Star Trek fans and non-fans alike. The special effects are excellent, the relationship between Kirk and Spock is funnier than ever, and Benedict Cumberbatch’s portrayal of the villain is outstanding. Indeed, one does not even need to get over the movie’s virtually non-existent storyline and the ridiculous way in which everything is done at a hundred miles an hour to make up for the plot’s numerous shortcomings to fully appreciate the movie for what it is. The poverty of Clash of the Titans was so blatant, it was embarrassing. Yet, after making an astonishing near-$500million, Hollywood has (rather unsurprisingly) made a sequel. And with Jonathan Liebesman (Darkness Falls, Battle: Los Angeles, Ninja Turtles) replacing Louis Leterrier as director, Wrath of the Titans is a marked improvement on the first in the series. 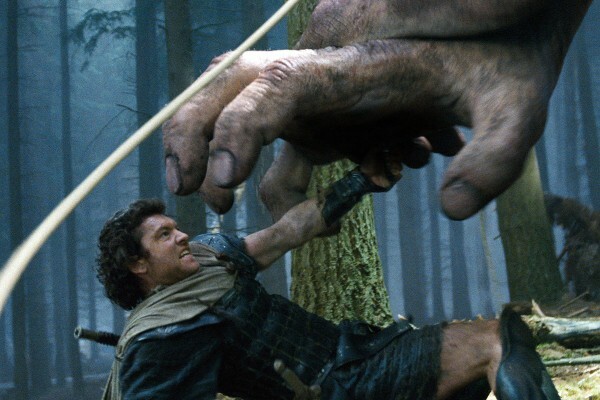 Perseus (Sam Worthington), the mortal son of Zeus, taking on a one-eyed giant. Perseus’s hand must be stronger than it looks to hold the giant’s strength at bay. Wrath of the Titans takes place in ancient Greece, ten years after Perseus defeated the kraken. With his wife now dead, Perseus (Sam Worthington – Clash of the Titans, The Debt, Drift) has to bring up his son, Helius (John Bell – A Shine of Rainbows, Battleship, The Hobbit I-II), alone. It is then that Zeus (Liam Neeson – Star Wars I, Clash of the Titans, The Dark Knight Rises), Perseus’s father, comes to Earth to warn his son that the gods need the help of the ‘half-gods’ to defeat the storm that is coming in the form of the vengeful titans. With treachery afoot in Tartarus, the underworld in which Hades (Ralph Fiennes – Clash of the Titans, Harry Potter VII(ii), Skyfall) is lord, it is only a matter of time before Cronus, the leader of the titans, unleashes his fury. Perseus will need the help of Hephaestus (Bill Nighy – Pirates of the Caribbean II-III, Harry Potter VII(i), I, Frankenstein), Queen Andromeda (Rosamund Pike – Die Another Day, An Education, Gone Girl) and her men, as well as the last of the gods and the ‘half-gods’ to defeat the evil that is to strike at ancient Greece. Yes, the storyline is as ludicrous as that. When a film opens up with a narrator saying that the ancient world was ruled by “gods and monsters,” one has a fairly good idea that he/she is not going to be watching a classic, intellectually-stimulating film (to say the least). 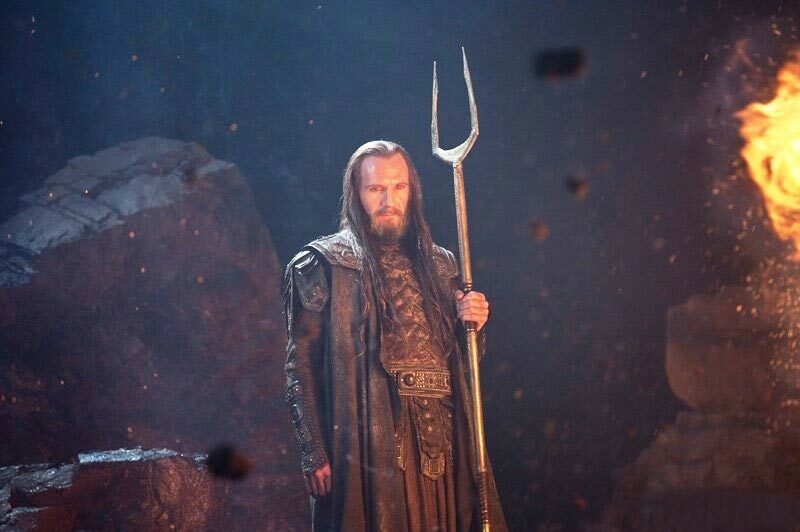 Hades (Ralph Fiennes), the younger brother of Zeus and Lord of the Underworld, holding his pitch fork. Will he side with the evil titans? In addition, Wrath of the Titans is surprisingly accurate when it comes to informing its audience on certain aspects of ancient Greek mythology, such as how Hades became Lord of the Underworld; and who made his forked-pitch, as well as Zeus’ bolt and Poseidon’s triton. However, the parts of the movie that have been done well are likely to be forgotten amidst the paucity of the rest of it. The music sounds like a contrived version of the uplifting score used in Transformers I-III. And if the music and the storyline aren’t bad enough, the acting and the dialogue are wooden and shallow. Sam Worthington, Rosamund Pike, Edgar Ramires (The Bourne Ultimatum, Carlos the Jackal, Zero Dark Thirty), playing Ares, and Toby Kebbell (Match Point, Prince of Persia: Sands of Time, The East), playing Agenor, are all seemingly unfit for their respective roles (and it’s not as if Worthington hasn’t played a hero before either). 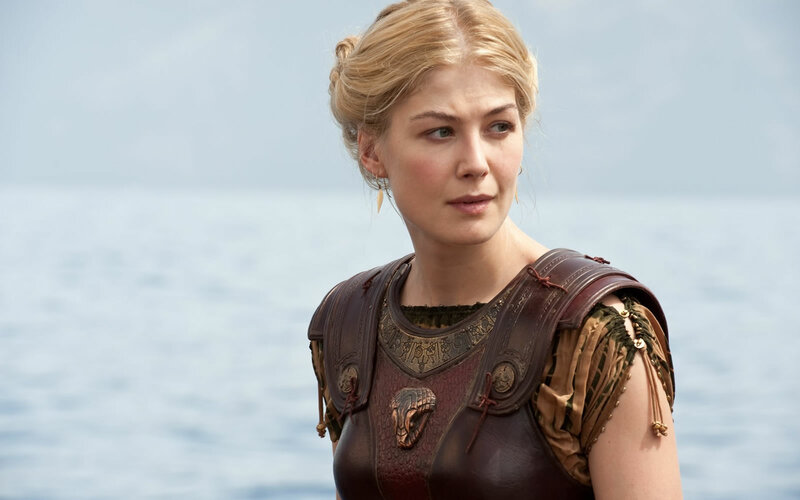 Andromeda (Rosamund Pike) looking good as a warrior queen in boiled leather. Will her army rally to her cause to save ancient Greece from the destruction that will be unleashed with the wrath of the titans? All-in-all, Wrath of the Titans suffers from similar insufficiencies as Clash of the Titans. The film has a ludicrous storyline, a cast that plays poorly, and an appalling script. 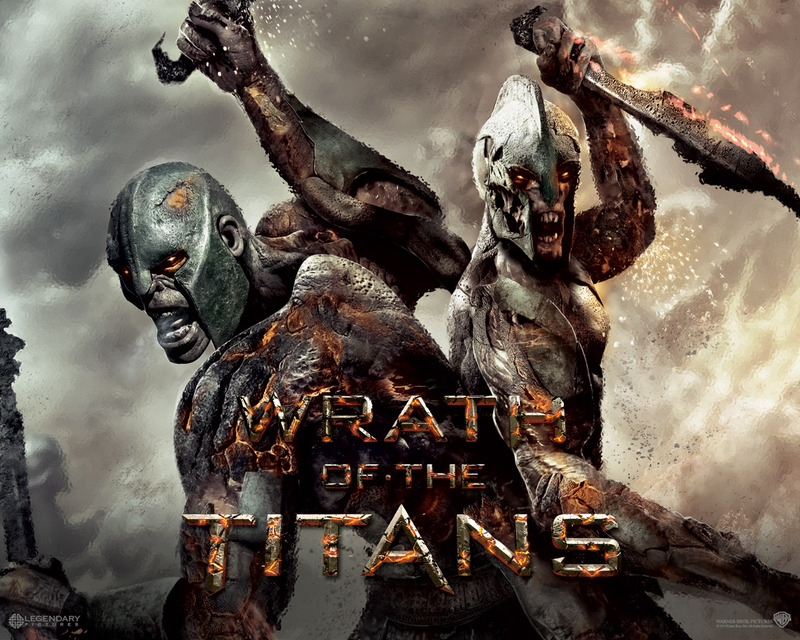 Nonetheless, Wrath of the Titans is quite entertaining and an upgrade on the first in the series. Not that that is saying much. When it comes to films about Mossad operations, such as Munich or Raid On Entebbi, they have a unique appeal that the average spy/secret agent movie doesn’t have. Undoubtedly, this is due to Mossad’s exceptional stealth and ruthlessness to find and deal with Israel’s most dangerous enemies. The highly enjoyable The Debt, once again, gives credence to the capabilities of the Israeli secret services. Young Rachel, Stefan and David in their leaky apartment in East Berlin. Their expressions indicate that the pressure might be getting to them. David, Rachel and Stefan draw up a clever plan to capture Vogel, get him out of East Berlin, and onto a plane to Israel, so he can face justice. But the plan goes awry, leaving the three Mossad agents to decide how best to deal with the potential consequences. The Debt’s storyline is realistic and adopts a non-linear timeframe, in a similar vein to Tinker, Tailor, Soldier, Spy and The Skin I Live In, since it ventures back and forth between the 1960s and the 1990s. But in contrast to the other two films, viewers are unlikely to find The Debt difficult to follow or overly confusing. This is because the movie has an absorbing plot, filled with suspense. With the music (although nothing noteworthy) pumping the adrenaline, it is doubtful that one will become bored throughout the 113 minutes of the film. In some ways though, The Debt should not have been so long because the last twenty to thirty minutes goes off on a tangent. This is highly injurious to the movie, as it takes away some of its realism. Vogel (Jesper Christensen) toying with David’s mind, whilst being bounded to a pole in captivity. The Debt may not be factual; nevertheless, it has many truthful and realistic elements. The film has echoes of the successful Mossad operation to capture Adolf Eichmann, a high-ranking Nazi who was involved in the planning of the Final Solution of the Jews, and the failed one to find the infamous Nazi doctor of Auschwitz, Joseph Mengele. Furthermore, the movie subtly hints at the police-state that was East Germany. Yet, there is no mention of the Stasi, the East German secret police, or the nature of Communist rule in post-1945 Eastern Europe. If one has no knowledge of the era, one will come out of the movie no more informed, which is again to the film’s detriment. Whether one becomes more knowledgeable about Soviet-ruled Europe is dubious, but from The Debt viewers can appreciate some very real moral and ethical conundrums. The issue of when justice must trump truth, and vice versa, is a messy and complex one. The film illustrates this in a mature way. 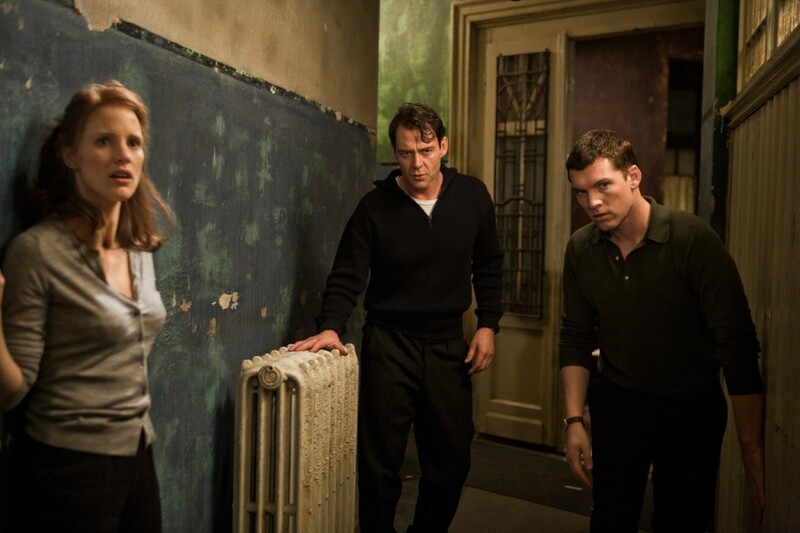 The same can be said for the problems and stresses that the three secret agents endure, and how they handle it (which they do differently to the agents in Munich); and for the psychological warfare that Vogel plays on young Rachel, Stefan and David. The way Vogel plays on their minds is done brilliantly. Yet, at the same time, it is sickeningly realistic because he always twists facts to ensure that there are elements of truth to his arguments. David and Rachel, thirty years later, discussing the past with pride and shame. Indeed, the actor playing Vogel, Jesper Christensen, is the star of the film, even if his role is relatively small. That he makes Vogel sound plausible and, perhaps, not even the villain adds credence to this. (And considering that Vogel conducted unspeakable experiments on humans, that is no small feat.) Unlike Christensen’s performance, those of the rest of the cast may not stand out, but no-one plays badly. Their characters may not all be explained well, but they all have some depth, which is revealed at various times during the film (although, all of the agents are too young for their supposed ages). With the exception of Sam Worthington (who sounds remarkably Australian for a German-born Israeli), their Israeli accents are believable. 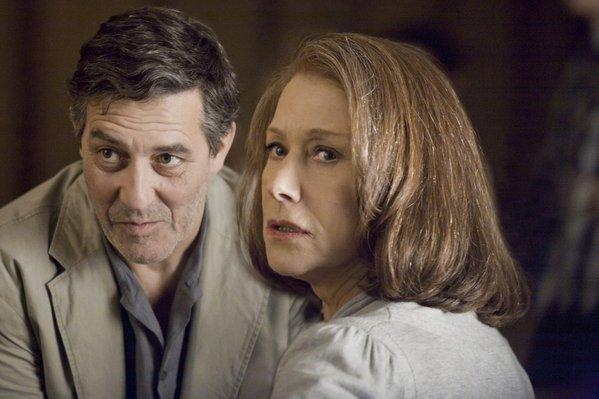 Ciarán Hinds, in particular, also looks very Israeli, as do his mannerisms. Over-all, The Debt is another worthwhile Mossad movie that is gripping and tense, despite not being true. It may not increase viewers’ knowledge of 1960s East Berlin or the Cold War, but one is likely to leave the cinema with a greater understanding for some profound dilemmas that heads of state and secret service agencies, including Mossad, have to deal with. (Now we look forward to the film about the assassination of Mahmoud Al-Mabhouh, the Hamas military operative, who was killed in Dubai, allegedly by Mossad, in January 2010). Zack Snyder’s 300 was the ultimate guy’s film. The movie, essentially, was a two-hour blood bath, as 300 Spartans defended their ancient homeland against a million-strong Persian army during the Battle of Thermopylae (approximately 494 BC). Although devoid of the (inaccurate) historical elements, Conan the Barbarian should be put into the same category of film. Conan, a beast of a man, relaxed and waiting for his opponent to make the first move, before he slaughtering him. 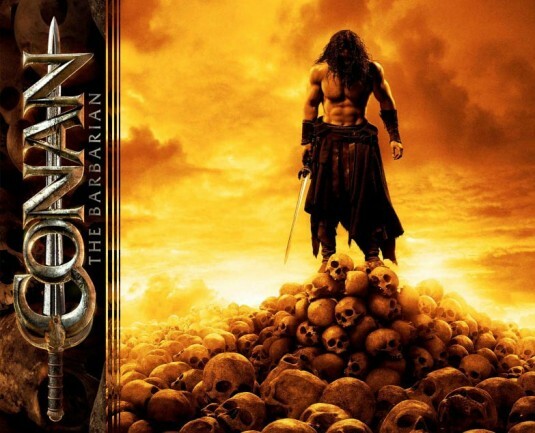 Conan the Barbarian is loosely based on the novel by Robert E. Howard, and is a remake of the 1982 film starring Arnold Schwarzenegger. Set in an alternate world called Hyborea (which looks much like Earth in medieval times), the movie centres round Conan, the eponymous character. As a young boy, Conan (Leo Howard – G.I. Joe: Rise of the Cobra, Shorts, Logan) is trained in the ways of the Samarian warrior cult by his father, Corin (Ron Perlman – Tangled, Season of the Witch, The Riot). 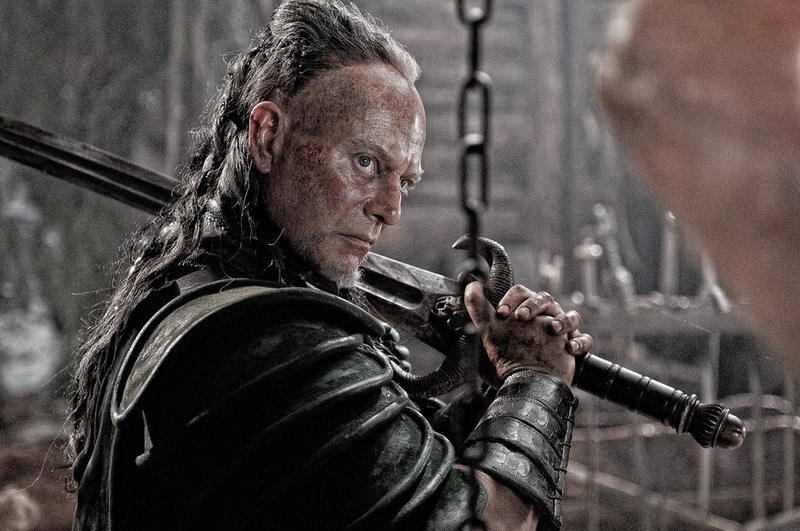 But not long into the movie, Corin is killed before his young son by Khalar Zym (Stephen Lang – Public Enemies, Avatar, Officer Down), a megalomaniac determined upon conquering all of Hyborea and reviving his dead wife. Khalar Zym will achieve these feats by putting back together all of the lost pieces of the Mask of Acheron. In time, Khalar also realises that he needs to sacrifice the last of the ‘pure blood’ of the sorcerers of Acheron, Tamara (Rachel Nichols – G.I. Joe: Rise of the Cobra, Star Trek, The Loop), to unleash the mask’s powers in order to take over the world. 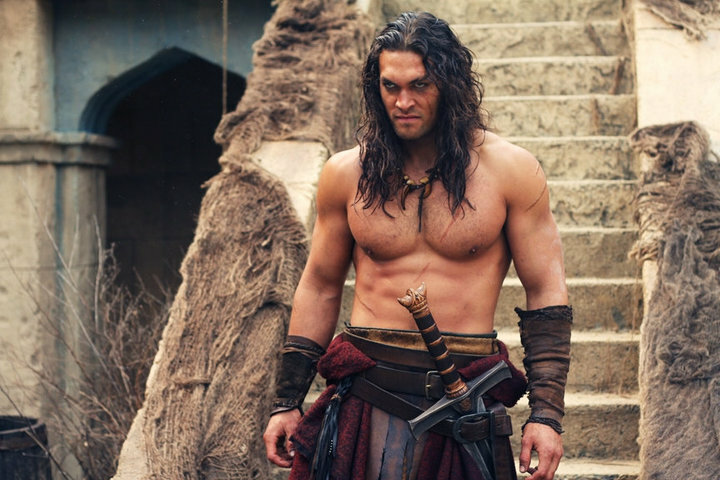 The balance of Hyborea rests in the sword-wielding abilities of the fully grown, muscular Conan (Jason Mamoa – Baywatch, Game of Thrones, Batman v Superman: Dawn of Justice), who is hell-bent on punishing those who killed his father. Despite the strange names, the plot for Conan the Barbarian is not difficult to follow. Its rushed introduction has a Lord of the Rings-like feel to it, while the breaking up of the mask reminds one of Voldemort making Horcruxes of his soul in the Harry Potter series. The villain, Khalar Zym, played by Stephen Lang, the trigger-happy military commander in Avatar. There is little sophistication in Conan the Barbarian’s storyline. Sometimes the simplicity is even comical. (Since when was child birth as trouble-free as sticking a knife into a womb and pulling out a baby, whilst looking away?) Similarly, the director, Marcus Nispel (The Texas Chainsaw Massacre, Friday the 13th, Pacemaker), does not attempt to make the characters anything but two-dimensional (which is not such a bad thing considering the nature of the film). As a result, the acting is far from memorable, and the dialogue is as risible as it was in the virtual disaster movie Season of the Witch. The acting and the dialogue, though, were never going to be the most noteworthy aspects of Conan the Barbarian. Rather, the movie’s success was also going to lie in the action scenes and the special effects. In both respects, the film does not let the audience down. All the actors look like they were well drilled in swordplay, while imagination and care were certainly put into the CGI. Marique (Rose McGowan), the witch-daughter of Khalar Zym, who helps her father find the last of the ‘pure blood’ of the sorcerors of Acheron. Additionally, the music score is not terrible either. Even if it sounds much like a combined take-off from The Lord of the Rings and Pirates of the Caribbean, the music aids many of the scenes. In some instances, it gives the film the complexity that the acting, dialogue and plot sorely lack. On the whole, Conan the Barbarian is as straightforward as its title. Just like with 300, Conan the Barbarian is very much a guy’s film. For it has a hulk of a main character, plenty of action, blood, and well-designed CGI. Yes, it has many noticeable and laughable defects, but viewers are unlikely to be bothered by them and will not go home disappointed.